It is increasingly likely that the Eurozone could become the Humpty Dumpty of currency unions. If so, this is a tragedy foretold by many observers. Martin Feldstein, for example, argued back in the late 1990s that there were too many cultural, institutional, and economic differences in the EU nations for a single currency to work. He even claimed that the currency union could lead to more conflict instead of reducing it as many Euro supporters claimed it would do. His skepticism of the Eurozone was shared by many others, particularly American economists, who saw a one-size-fits all monetary policy as destabilizing to the regional economies in the EU. For all these naysayers, though, there were supporters who argued that political gains will trump any economic costs in the monetary union and that over time many, if not most, of these costs would disappear as the regional EU economies converged. Well so much for the Euro optimists. Many folks are now saying that at a minimum there needs to be a "shock and awe" bailout package as high as $1 trillion to keep Eurozone intact. Yikes. As shown in this recent post of mine and by others, several of the Eurozone countries fell inside the OCA boundary, Greece being one of them. This is not a surprise to most folks including the Euro optimists, but many hoped that these criteria would be met ex-post as the economies integrated. This leads to the second lesson. (2) Don't hang your hope on becoming a successful currency union by meeting the OCA criteria ex-post. Some observers argued around the time of the Eurozone's inception that looking at the OCA criteria ex-ante was not warranted since the criteria themselves would emerge once a currency union was formed. This "endogenous" view of the OCA gave hope to the Euro optimists and lent support to their cause. Now there is evidence that joining a currency union does stimulate trade as transactions costs are lowered. One study found currency unions more than tripled trade among members. 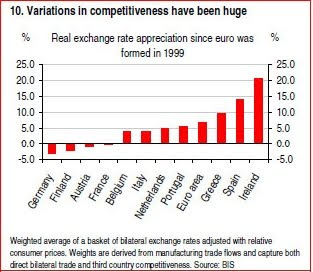 It is apparent now, though, that some of the Eurozone periphery did not integrate enough to justify the cost of being a member in the currency union. It is best not to base the survival of a currency union on hope. As an aside, it is worth nothing that even if a region does endogenously meet the OCA criteria further problems can arise from being a part of the currency union. The increased trade flows and economic activity within the currency union can over time lead to regional specialization that makes the regions more susceptible to economic shocks. Paul Krugman first made this point in 1998 and the idea has become known as the "Krugman Specialization Hypothesis" (KSH). I think the best example of KSH is the United States. Despite being a currency union for many years, the United States did not become an OCA until the 1930s according to Hugh Rockoff. One reason is because there was so much regional specialization and until the New Deal reforms, many of the economic shock absorbers necessary to offset the lack of regional economic diversification were simply missing. 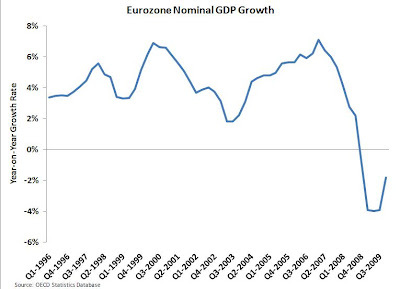 So even if the Eurozone were a functioning OCA there is no guarantee it would stay that way. (3) Take the real exchange rate seriously. A summary measure of a country's external competitiveness is its real exchange rate. If a country's real exchange rate is appreciating then its goods are becoming more expensive to the rest of the world. And, as a result, it will begin losing foreign earnings and the ability to meet external obligations. In a time of crisis for a country dependent on foreign funding this problem becomes more pronounced. As seen in the next figure, most of the Eurozone periphery has had a real appreciation on average since the inception of the Euro! Now to understand why the periphery has had the real appreciation, one has to look at the three components of the real exchange rate: domestic prices, foreign prices, and the exchange rate. For Greece the problem was twofold. First, because of wage pressures domestic prices rose, more so than in the core Eurozone countries. Second, given its membership in the Eurozone, Greece had a fixed exchange rate and, thus, no chance for its currency to depreciate. To get out of this bind Greece can either have painful deflation or end its use of the Euro. Given where Greece is now, leaving the Euro may seem like lesser of two evils for Greek leaders. (Just to be clear, a depreciation will not solve Greece structural problems, but it make it easier to address them.) Any country joining a currency union should consider the implications of membership on its real exchange rate. 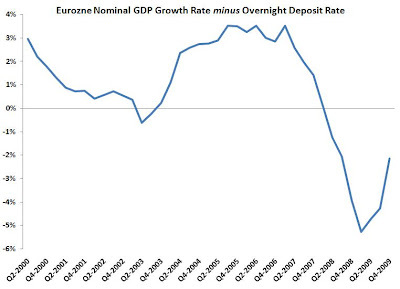 According to this measure, monetary policy in the Eurozone has been rather tight over the last year. 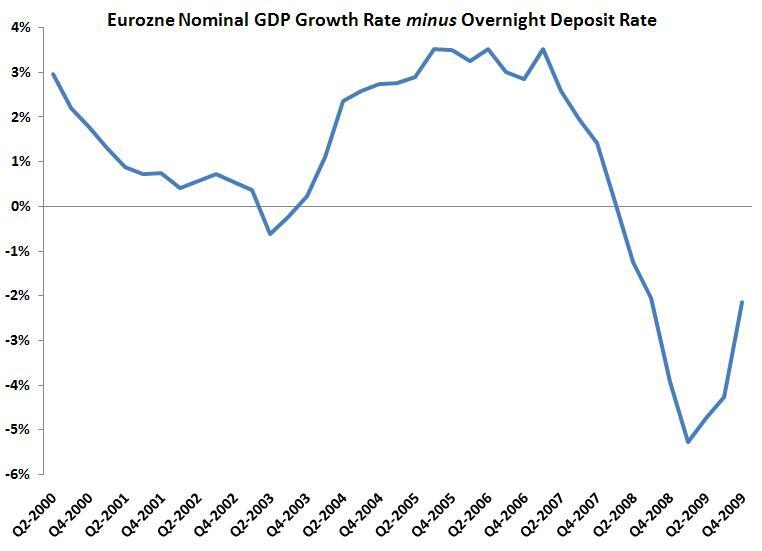 The Eurozone's future would have been more secure had the ECB been more vigilant in stabilizing aggregate demand. So what lessons do you see from the Eurozone crisis? I think you've covered the key themes. One minor variation might be housing markets. I think Andrew Oswald of Warwick University once produced regressions that showed, other factors constant, countries with higher rates of home ownership had on average higher unemployment rates. Presumably the US now is not inconsistent with that. Govt policy to encourage home ownership has made the US labor market less flexible than it once was. What you say is good, David. One thing you left out is "runs". And the need for a combined monetary and fiscal authority to deal with them. a) If there are runs on banks, it is always difficult to distinguish what is a liquidity and what is a solvency problem. A central fiscal and monetary authority, working together, can make the decision to supply liquidity (monetary) and funds (fiscal). b) if there are runs on a country's bonds, a central fiscal and monetary authority, working together, can make that same decision. While everyone is fretting over the sovereign debt crisis I'd like to point out how this has impacted euro zone expansion. The three most likely countries to join the euro are the Baltic States. They are all in ERM II and have kept their currencies pegged throughout this recession. All three have been devastated with GDP down some 30% in Latvia for example. This stands in stark contrast to nations like Poland (no recession)that retained flexible currencies. Furthermore, all three had very low public debt going into the recession. Now Latvia is facing soaring public debt. I would underscore your point on the ECB's excessively tight monetary policy. But then I have to wonder about our own policy given our decline in nominal GDP last year. What is wrong with our central banks? Where is the U.S. Currency?